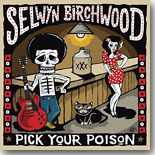 Alligator artist Selwyn Birchwood is a blues star in the making. Don't believe it? Then be sure to listen to his second CD, Pick Your Poison, this month's Pick Hit. A soulful singer from Florida, Lauren Mitchell, has produced our Surprise CD of the month in her self-released Desire. Our Flashback feature looks back at Guitar Slim Jr.'s 1987 release, The Story of My Life. Our What's New section features new CDs from Big Bill Morganfield, John Nemeth, Eric Bibb, Vanessa Collier, Professor Louie and the Crowmatix, Sean Chambers, Adrianna Marie, Bob Gardner, Eliza Neals, Vaneese Thomas, The Soul of John Black, and more.